Summer is here and to me that means one thing… holidays! When I think of a holiday, I think of books. Whether you’re going to Europe, America, the Caribbean or more tropical climes this summer, I’m sure most of you will be stuffing a few paperbacks in your suitcase to read while you’re basking in the sunshine by the pool or on the beach. With the introduction of Amazon’s revolutionary Kindle and Kindle 3G you now have thousands of books at your fingertips. Every year airport bookstores get a huge influx of travellers in July and August who are looking for books to while away the time. Although this uplift in sales is great for stores like WH Smith, the average traveller often finds that their chosen reading material takes up quite a bit of space – especially if like many of my friends you are a speed reader. It can get to the stage that you’ve got a paperback squirreled away in every bulging pocket of your luggage. Thankfully there is now a solution for those who are tired of lugging around handfuls of paperbacks. The Amazon Kindle has come to the rescue. This handy device is a godsend to any literary traveller as it weighs a mere 247g – which is much lighter than the average paperback. What’s more, the Kindle is capable of storing up to 3500 books. That wasn’t a typo. I said 3500! The Kindle is unashamedly the size of an impressive library and yet comes in a compact hand held package that will satisfy even the most avid of readers at home and abroad. The Kindle comes in two versions. The standard Kindle costs only £111. 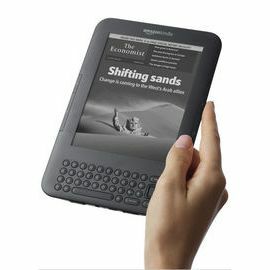 If you want 3G wireless functionality – and let’s be honest, who doesn’t these days – then you can purchase the Kindle 3G for £152. That may sound a bit high but is the same price as a good iPod. More importantly, once you have the Kindle 3G in your grasp you have the benefit of being able to access thousands of titles within minutes from Amazon. In fact, Amazon proudly boost that you can “think of a book and start reading it in 60 seconds”. That’s a hell of a lot faster than the time it would take you to shop at a regular airport bookstore and avoids those tiresome never-ending queues that we’ve all had to put up with time and time again at the airport. Now with the Kindle you have a whole bookstore to yourself and you’re only a few quick clicks away from the bestseller list or your favourite authors and genres. Kindle screens can be read clearly in direct sunlight – perfect during summer sun! Kindle has up to one month battery life – handy on those 14 night holidays! Kindle 3G has no monthly bills or annual contracts – you only pay for the books downloaded! You can learn more about the Kindle at http://www.amazon.co.uk. For the fashionistas out there or just those who want to protect their precious little Kindle, there is a wide range of jackets out there in dozens of designs and finishes to keep your Kindle safe and sound. My favourite are the leather jackets available at Amazon – right now there is a special Kindle Summer Promotion at Amazon where you can get 20% off any Amazon Kindle cover with your Kindle or Kindle 3G purchase. So what are you waiting for? Click here to buy your very own literary powerhouse and get ready for a whole new reading experience that will change the way you buy and read books forever! Where Do You Stand on the Baseline? Tagged amazon, books, kindle. Bookmark the permalink.